Along with Primal Roast, Kaf Coffee was top of people’s recommendations to visit when I was in Glasgow in May for the Glasgow Coffee Festival. A very recent addition to Glasgow’s growing speciality coffee scene, it only opened in March, which tells you something about the impact it’s made given how many people recommended it to me. Kaf Coffee nicely fills in a gap as Glasgow’s speciality coffee scene extends to the west. It’s just off the Dumbarton Road, not far from the likes of Siempre Bicycle Café, and provides a useful stop if you’re determined to wander the length of Dumbarton Road to visit the western outpost that is Meadow Road Coffee. Kaf Coffee is a true multi-roaster café with a commendably-concise coffee menu and several options on espresso and pour-over. It’s always a pleasure to find somewhere serving James Gourmet Coffee, which is a mainstay on espresso, with a couple of single-origins from various roasters via the Kalita Wave filter. For somewhere so small (you’d be lucky to get 10 people inside), Kaf Coffee has impressive breakfast and lunch menus, all made in the kitchen at the back. If that wasn’t enough, there’s a decent selection of cake too. Kaf Coffee’s a tiny spot, with a narrow, square front on Hyndland Street, overlooking Mansfield Park to the east. Just north of the busy Dumbarton Road, it’s a quiet spot, making the solitary table on the pavement beneath the window a decent option. Kaf Coffee has a solitary, tall window to the right, which dwarfs the half-glass door to the left. Inside it’s bigger than it looks, although this is partially due to its height: taller than it is wide, it’s maybe twice as deep, with the counter at the front, seating at the back. Other than wooden floorboards, counter-top and furniture, the interior (and exterior for that matter) are painted white, giving Kaf Coffee a very clean, uncluttered look, which, coupled with the high ceiling, give it a sense of space out of all proportion to its actual size. The white interior, plus the generous window, also makes it very bright. However, sunlight is of no use during the long, Scottish winters, so there are four huge lights hanging from a suspended lighting rig in the front of Kaf Coffee, while four smaller spots hang from a lighting bar at the rear. The counter’s on the right as you enter, running lengthways down the store. The cake comes first, partly occupying the window sill, then comes the Mythos 1 espresso grinder, plus a two-group La Marzocco Linea. The counter curves around towards the wall at the back, creating space for an Über boiler and EK-43 grinder. All-in-all, it’s an object lesson in efficient space use. There’s shelving on the wall opposite the counter, leaving enough space to get past to the seating in the back half of the store. There’s a wooden bench against the left-hand wall with two square tables. The first is slightly larger (three-person), while the second probably only seats two, the additional seating provided by stools. On the right, beyond the counter, is a three-person bar with stools, although it’s very narrow, so there’s little leg room beneath it, a real problem if you’re tall. The espresso changes on a weekly basis and is usually from James Gourmet, although there are occasional guests. While I was there, there was a James Gourmet Ethiopian single-origin on espresso which I was heartily tempted to try, although I was rather espresso-ed out that day. The pour-over coffee changes every couple of weeks, with a rotating cast of roasters. 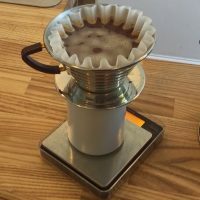 During my visit there was a Burundi from Colonna Coffee and a Rwandan from Fortitude, one of a crop of Edinburgh coffee shops which have started roasting. Keen to try Fortitude’s output, I went for that, rewarded with a superb coffee, served in a handleless, tin carafe with a tulip cup on the side. The coffee itself was very delicate, fruity and subtle, more than holding its own as it cooled. Clearly Fortitude’s no novice when it comes to roasting! Kaf Coffee, by the way, is typical of speciality coffee’s wide community. The owner, Leonora, cut her teeth in Edinburgh’s Brew Lab, now splitting her time between the counter and the kitchen (which closes at 3pm). Meanwhile, Anne, my barista, is German, but has worked in Melbourne and Edinburgh (Artisan Roast) before moving to Glasgow, where she worked at Avenue. The team’s completed by Lyle, who’s full-time in the kitchen. Liked this Coffee Spot? Then check out the rest of Glasgow’s speciality coffee scene with the Coffee Spot Guide to Glasgow. If you’d like to know more about Leonora, Kaf Coffee’s founder, then try this interview, part of an awesome series by Scotland Coffee Lovers on women in speciality coffee in Scotland. This entry was posted in Breakfast, Cafes, Cake, Glasgow, Laptop Friendly, Lunch and tagged include by Brian Williams. Bookmark the permalink.